My Bible study this morning had me reading Matthew 27, in which we read of Jesus’ crucifixion and the events that happened at that time. Thallus wrote a history of the eastern Mediterranean world since the Trojan War. Thallus wrote his regional history in about AD 52. Although his original writings have been lost, he is specifically quoted by Julius Africanus, a renowned third century historian. Africanus states, ‘Thallus, in the third book of his histories, explains away the darkness as an eclipse of the sun—unreasonably as it seems to me.’ Apparently, Thallus attempted to ascribe a naturalistic explanation to the darkness during the crucifixion. Phlegon provides powerful confirmation of the Gospel accounts. He identifies the year and the exact time of day. In addition, he writes of an earthquake accompanying the darkness, which is specifically recorded in Matthew’s Gospel (Matthew 27:51). However, like Thallus, he fallaciously attempts to interpret the darkness as a direct effect of a solar eclipse. On the whole world there pressed a most fearful darkness; and the rocks were rent by an earthquake, and many places in Judea and other districts were thrown down. This darkness Thallus, in the third book of his History, calls, as appears to me without reason, an eclipse of the sun. For the Hebrews celebrate the passover on the 14th day according to the moon, and the passion of our Savior falls on the day before the passover; but an eclipse of the sun takes place only when the moon comes under the sun. And it cannot happen at any other time but in the interval between the first day of the new moon and the last of the old, that is, at their junction: how then should an eclipse be supposed to happen when the moon is almost diametrically opposite the sun? Let opinion pass however; let it carry the majority with it; and let this portent of the world be deemed an eclipse of the sun, like others a portent only to the eye. Phlegon records that, in the time of Tiberius Caesar, at full moon, there was a full eclipse of the sun from the sixth hour to the ninth—manifestly that one of which we speak. But what has an eclipse in common with an earthquake, the rending rocks, and the resurrection of the dead, and so great a perturbation throughout the universe? Surely no such event as this is recorded for a long period. 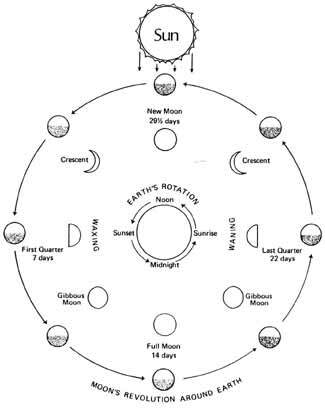 Africanus rightly argues that a solar eclipse could not have occurred during the lunar cycle of the Passover, as this diagram shows. He also questions the link between an eclipse, an earthquake, and the miraculous events recorded in Matthew’s Gospel. Eclipses do not set off earthquakes and bodily resurrections. We also know that eclipses only last for several minutes, not three hours. For Africanus, naturalistic explanations for the darkness at the crucifixion were grossly insufficient, as he showed by applying real science.